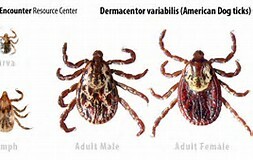 With tick borne diseases on the rise, protecting yourself, your family and your pets from ticks is important. By being aware and taking steps to prevent tick bites, you can enjoy the outdoors stress free. 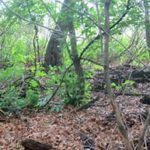 Tick habitat is in shady, damp, brushy, wooded areas including shrubs and gardens. Ticks cannot jump or fly. They attach to people, pets, or other animals that brush up against them. Nymph stage ticks are mostly found at ground level. Adult stage ticks can be found up to a couple feet off the ground on vegetation. Do a tick check after coming inside and tumble-dry clothes for 20 minutes. Wearing light-colored clothing makes it easier to see ticks. Use repellents; read and follow all label instructions. There are two types of repellent; Products containing DEET may be used on skin. 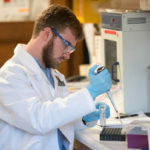 Products containing Permethrin may be used on clothing, not skin. 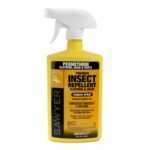 Use Permethrin to treat clothing (active for 6 washings) or purchase pre treated clothing (active through 70 washings). Using pointy tweezers, grasp the tick by the head (as shown) and pull straight up. Avoid twisting. DO NOT USE: matches, cigarettes, petroleum jelly, gasoline, nail polish remover, etc. After removing tick, apply anticeptic to bite area. Note date when tick was removed. 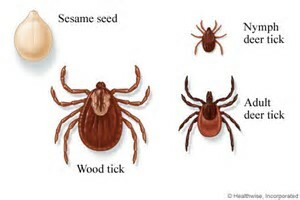 Also called black legged ticks, they can transmit the pathogens that cause Lyme disease, babesiosis, anaplasmosis, Powassan and relapsing fever. Lone Star can transmit the pathogens that cause Erlichciosis, STARI and tularemia. 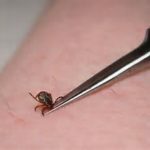 In addition, the bite of a lone star tick can cause an allergy to red meat! Yikes!!! Dog Tick can transmit the pathogens that cause tularemia and Rocky Mountain Spotted Fever.